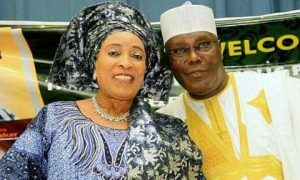 It has been revealed that Pastor Akpan-Jacobs accused of defrauding Mrs Titi Atiku, wife of former Vice-President Abubakar Atiku of millions was her ‘errand boy’. Mrs Titi Atiku, wife of former Vice-President Abubakar Atiku, told an Ikeja High Court that Akpan-Jacobs, the pastor, who allegedly defrauded her of N918 million was her “errand boy”. Titi made this claim while being cross-examined on Wednesday by Mr Amos Ibe, the defence counsel to Akpan-Jacobs. “I paid N49 million for the land used as the premises of THA Shipping, my partner Fred Holmes never contributed to the buying of the land but he contributed to the building of the property. “The N49 million was given to Akpan-Jacobs to purchase the land, but did not know who he bought the land from. “He never contributed a dime, he was just like an errand boy,” Atiku said. The News Agency of Nigeria (NAN) reports that the Economic and Financial Crimes Commission (EFCC) had charged Akpan-Jacobs with a 14-count charge bordering on conspiracy, stealing and fraudulent conversion of property worth N918 million belonging to THA Shipping Maritime Services Ltd.
THA Shipping Maritime Services Ltd, a company created in 2000, is owned by Atiku, Akpan-Jacobs and Fred Holmes, her German business partner. Atiku was alleged to be the majority shareholder with 49 per cent shares, while Holmes and Akpan-Jacobs each had 25 per cent shares. Akpan-Jacobs, who also doubled as the company’s Managing Director and Secretary, was alleged to have gone to the Corporate Affairs Commission (CAC) to alter the shareholding in his favour and forged the company’s board resolutions. He allegedly allotted 70 per cent shares to himself and 15 per cent shares each to Titi and Holmes. Responding to Atiku’s claim that Akpan-Jacobs was her errand boy, Ibe asked: “He was made a Managing Director (MD), how can an errand boy be made an MD ? “He was made an MD to stand in for Mr Fred Holmes because Holmes had not resigned from his job. The wife of ex-VP denied Ibe’s claims that Akpan-Jacobs owned and promoted THA Shipping Maritime Services Ltd and only brought her on board to bring in big briefs and clients. “Is he the one who bought the land, built the building? He was merely supervising. “My clout gave the company a lot of prestige, a lot of people wanted to do business with us and people brought a lot of containers to us,” she said. NAN recalls that while giving evidence on May 23, Atiku had told the court that she had used her maiden name, Florence Doregos, for business transactions because she was serving in government at the time. She denied Ibe’s accusations that Akpan-Jacobs never forged her signature either as Florence Doregos and Titi Abubakar in company documents. Mrs Atiku also denied Akpan-Jacobs claims that she never contributed to the construction of the building that housed the company. “I have a breakdown of the costs used in the construction of the building, Akpan-Jacobs gave me the breakdown in 2002 but he did not sign it. “I never said the property was built by Julius Berger, Mr Holmes was a Julius Berger staff and he might have used his connections to make the building a solid structure. “There was a document that Akpan-Jacobs had showed me that was signed Abubakar, I told him that that was not Titi Abubakar’s signature. “He forged Florence Doregos signature in a number of documents,” she said. Atiku also told the court that she and Holmes on April 6, 2009 passed a resolution removing Akpan-Jacobs from the ownership of THA Shipping Maritime Services Ltd.
“He had sold the property by the time we passed that resolution but we wrote to Akpan notifying him of what we wanted to do. “My lawyer, Mr Chima went to Dana Motors Ltd made efforts to stop the sale of the property because by then, they had not given Akpan much money for the sale of the property. “When Mr Chima went to Dana Motors Ltd to tell them that the property was not for sale, they confided in him that the property was sold to Akpan for N918 million. “I only gave power of attorney to one Ms Springerbeck, a German citizen; I, however, reverted the power of attorney to my lawyer after I noticed that she had a lot of excesses. “Akpan used the property as a collateral for a loan from First Bank because he needed funds to run for governor of Akwa-Ibom. “When he could not pay the loan and settle his creditors, he sold THA Shipping Maritime Services Ltd.
“I am not aware that a deed of assignment was signed by a secretary and director of the company, Akpan did not introduce any secretary to me,” she said. Mr Babatunde Sonoiki, the EFCC counsel, while re-examining Atiku, asked if she signed any the company resolutions used in the alleged fraud. Justice Oluwatoyin Ipaye adjourned the case until July 6 for continuation of trial.